You’ve built a strategy you’re so proud of, it can’t fail. You’ve found the perfect publishing tool and have all your posts scheduled for just the right time. Your community management is on point and engagement is through the roof. You’re tracking every metric and measuring the success of your strategy. Yet no matter how organized you are, your day-to-day life is still more chaotic than anyone else’s in your company. You’re missing an image for tomorrow’s social post. Your team doesn’t understand the tone of voice or visual unity you’re trying to maintain on Instagram. You’re going back and forth with your client to get their approval on your editorial calendar. You need an edit on a graphic that was supposed to go live an hour ago. Sound familiar? Trust me, we’ve been there. The good news is there’s a solution. 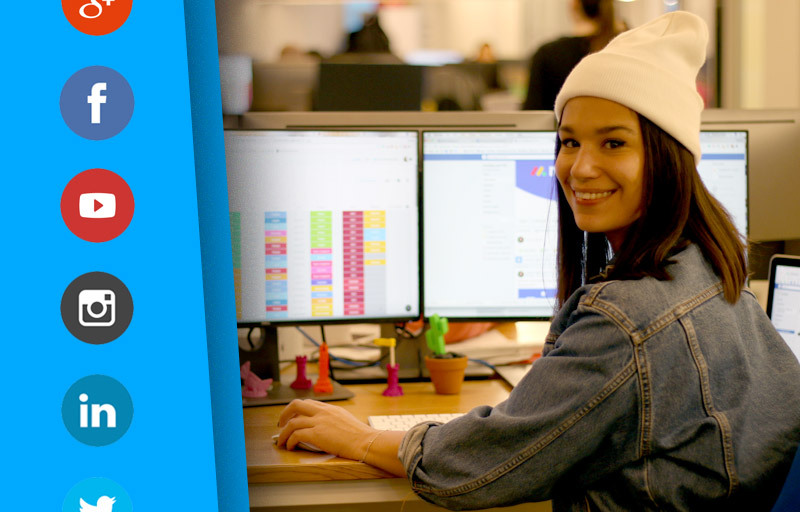 Here are the three biggest challenges we’ve encountered managing the social plan here at monday.com and the templates we use to solve them. After you’ve finished planning your social media schedule for the week or month, the next step is to connect with your team of designers and copywriters. Your goal is to create beautiful images, infographics, and content to distribute across your social channels. The problem is, keeping everyone up-to-date and getting your assets ready to schedule in your favorite publishing tool (Buffer, Hootsuite, or Coschedule) can quickly get out of hand. The asset you assigned isn’t ready. The designer doesn’t know what’s going live when. No one has access to nor understands how your scheduling tool works. 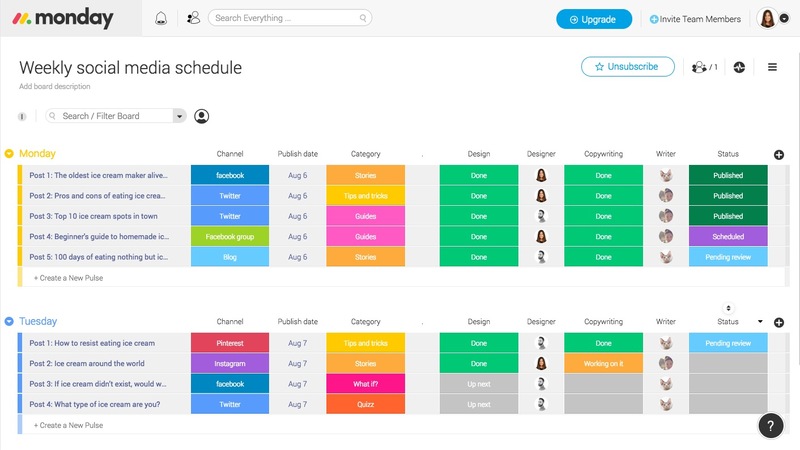 Moreover, a tool like Buffer or Coschedule doesn’t help your team sync on your editorial calendar. They’re perfect for scheduling and posting, but they lack the essential function of helping your team plan, collaborate, and execute together. Just like that, your perfect social media plan is collapsing. Social media marketing isn’t only about publishing content on social platforms. Your daily tasks also include responding and engaging to comments, testing links on social networks, updating social media reports, social listening, answering Quora questions, and much more! 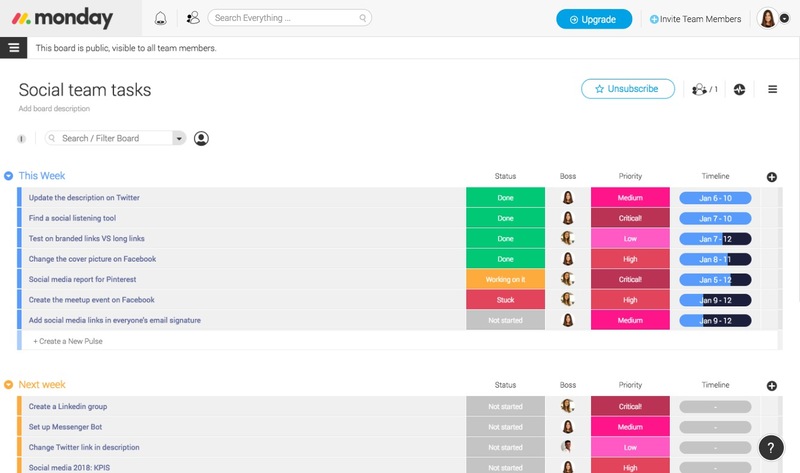 The challenge here is to manage your team’s workload and get everyone synced on who’s doing what. If you work with teams across multiple offices, cities, or countries, the potential for confusion is tenfold. When you’re working as a social media manager for one or several external clients, you can quickly find yourself in an endless back and forth of email exchanges. You need to get their approval, share your progress, update them on reports, and more. Again, the tool you’re using for your social media plan doesn’t include client management. You need more than a visual display of your tasks or a content calendar. You also need a place to communicate and share visuals. The communication feed in monday.com is a place to share visuals, upload documents, provide links, and start conversations. Everything is saved and easy to find when you need it. Clients will always know where everything stands so they don’t need to email or call you.